I had the best intentions to regularly blog throughout our six week Guided Group ride through Chile, Argentina and Brazil keeping you all in the loop of the highs and lows of travelling with a 7 month old and more importantly the horse riding that we were getting up too. BUT thanks to slow to non existent internet connection (which was a welcome novelty to be un-plugged from the technical world for awhile) and exhaustion I didn’t manage to even string a sentence together on my laptop nor my journal. Thankfully we did take a bucket load of images which will help jog my memory of what we got up to. So here we begin in the Streets of Santiago, Chile. Our first full day we took the metro into the centre of town to visit the relatively new Museum of Memories and Human Rights. I recommend purchasing the English translator gadget if your Spanglish isn’t up to scratch. 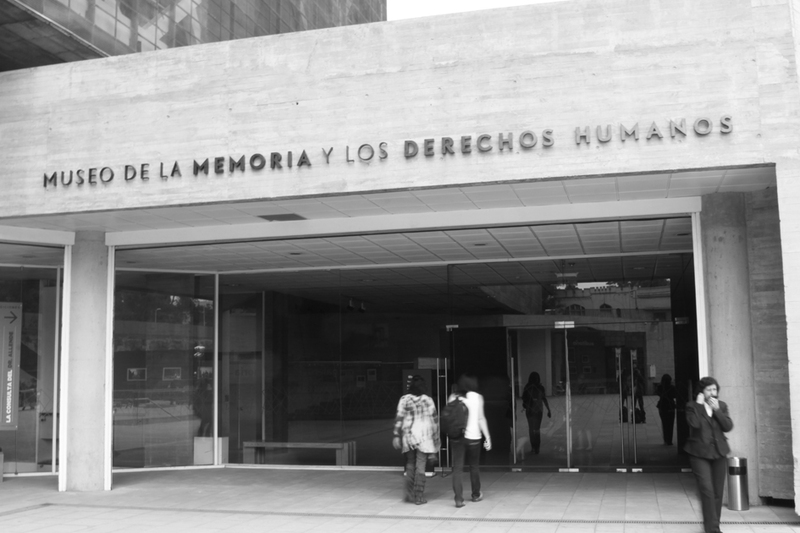 The emotive photography and art displays come to life when you tune into the historical accounts of the dictatorship. This isn’t your normal out of date, stuffy museum that you often find in capital cites. Chileans can be proud of this mixed-medium exhibition portraying their colourful and heart-breaking past. Its a lovely way to freshen up on your Chilean history, without yawning with boredom. Side note: be careful on the metro, make sure you hold onto your valuables with TWO hands, a foot and a leg. Mum got her camera stolen from her backpack here, very swift and sneaky thieves about. Our lovely GT client Robin Thomas kissing a Chilean suitor. 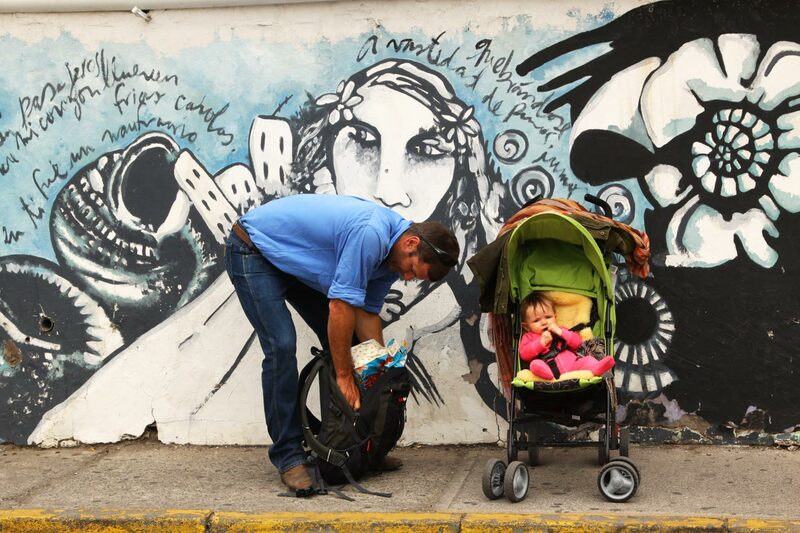 The street art through the suburb of Bellavista is worth stopping to admire. After our visit to the Museum we took the metro to the vibrant, leafy green suburb of Bellavista. 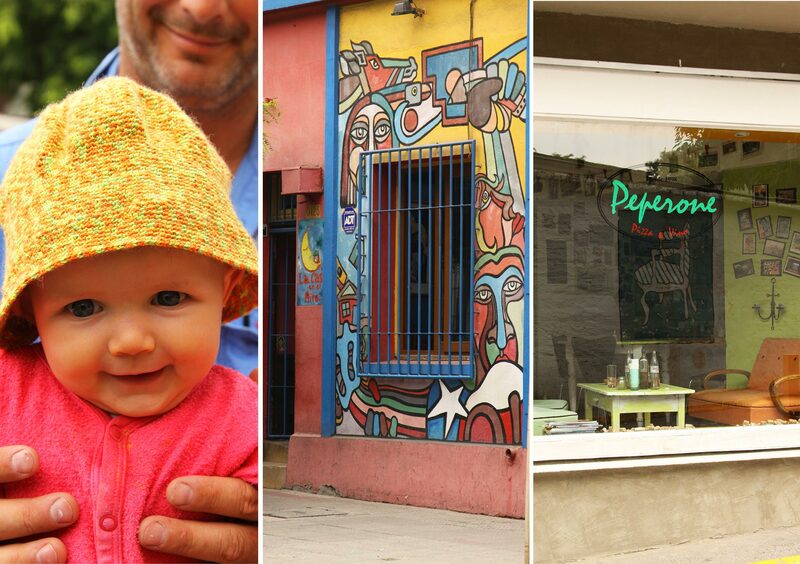 I adore this barrio with its bohemian, artisan feel. 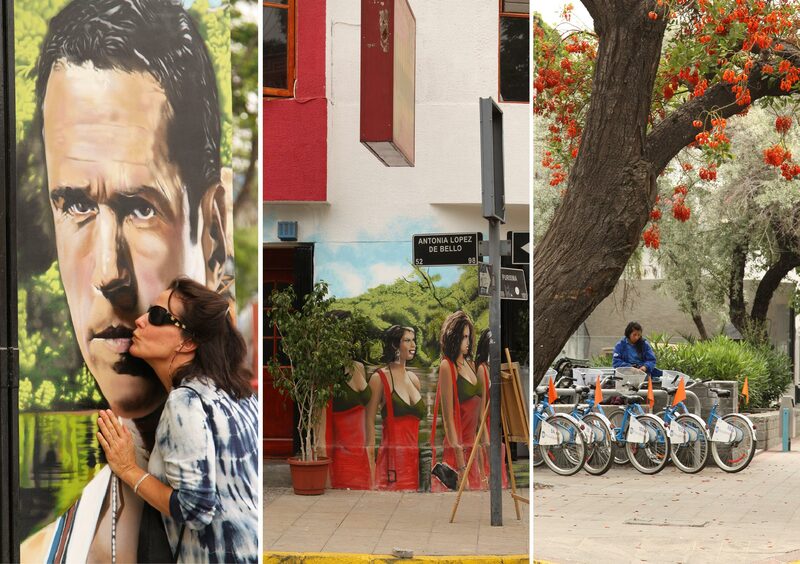 It’s a melting pot of hip restaurants, art galleries, chic boutiques and excellent street art. After reading encouraging reviews online, I took our guests, Bernadette and Robin, to a popular traditional restaurant to get their first taste of Chilean fare. 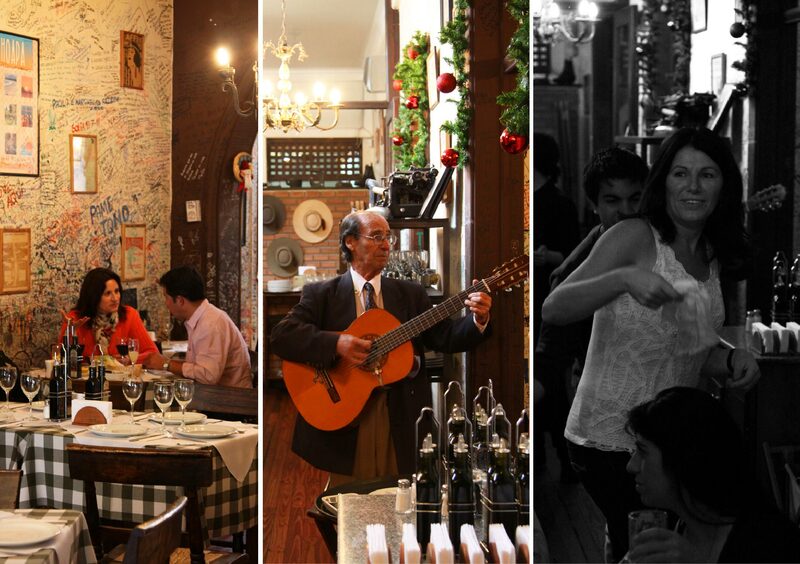 We walked down a nondescript street away from the popular ‘eat streets’ to find El Caramaño. Walking through the doors you could instantly tell that it was a locals haunt. At first our table of five plus Finn and another couple were the only people in the restaurant, typical gringos, sitting down to lunch at 1pm! But by the time our pisco sours and complimentary bread had arrived the restaurant was packed to full capacity. The walls are covered in signatures, names and notes from past diners, don’t worry I couldn’t miss the opportunity to plug globetrotting on a spare spot on the wall. We feasted on empanadas which are a golden pastry envelope of goodness stuffed with either ham and cheese, cheese, seafood, minced meat (delish – the equivalent of a meat pie to an Aussie) as a sneaky starter. And for the main meal I had the caldillo de congrio which translates to Conger Eel soup which is an all time favourite meal for me. I was well and truly satisfied and looking for a bed to lie on for a nanny nap. A young Chilean gentleman approached me with a white napkin and asked me to dance. I couldn’t refuse especially with the señor in the corner strumming out live music, it would of been rude to say no. After a wee while of dancing awkwardly with the white napkin flapping about, I cajoled Bernadette into taking over the hankie flag and as you’ll see above she had a true knack for white napkin dancing. Finn trying on a stylish new hat; street art in Bellavista, groovy cafe near Pablo Neruda’s house. I’m a massive fan of Chilean poet Pablo Neruda – have you heard of him? If not, check him out here. I fell in love with his prose when I first visited Chile in 2005 after buying one of his book’s in Santiago. I travelled through Patagonia reading his poetry which described the dramatic, wind-swept region so beautifully. Visitors to Santiago can visit his home in Bellavista where you can pay for a English guided tour. He was an incredibly quirky man with a obsession in collecting the strangest of items. Its well worth a visit to his home as its cooky and out-of-the box, whether you’ve heard of him or not, the guides are extremely good in bringing this well-known poet to life. 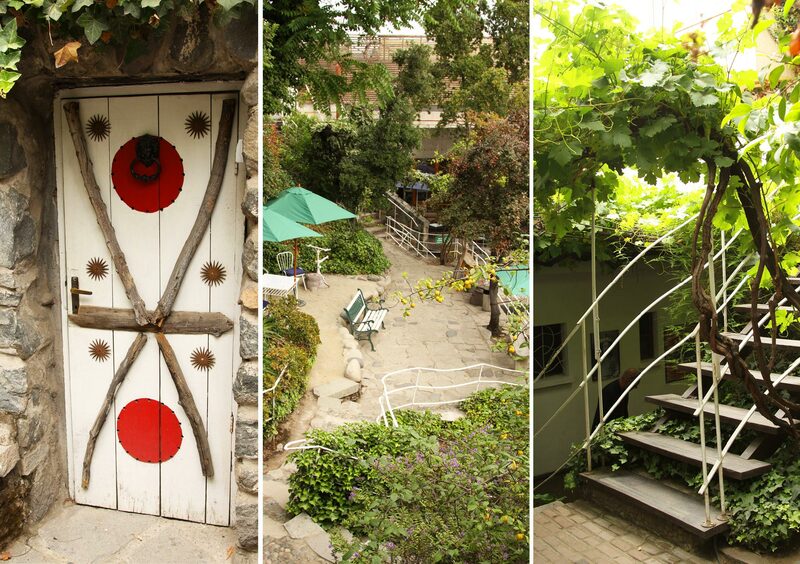 Some snap shots of Neruda’s house externally. You’re not allowed to take shots of inside the house. 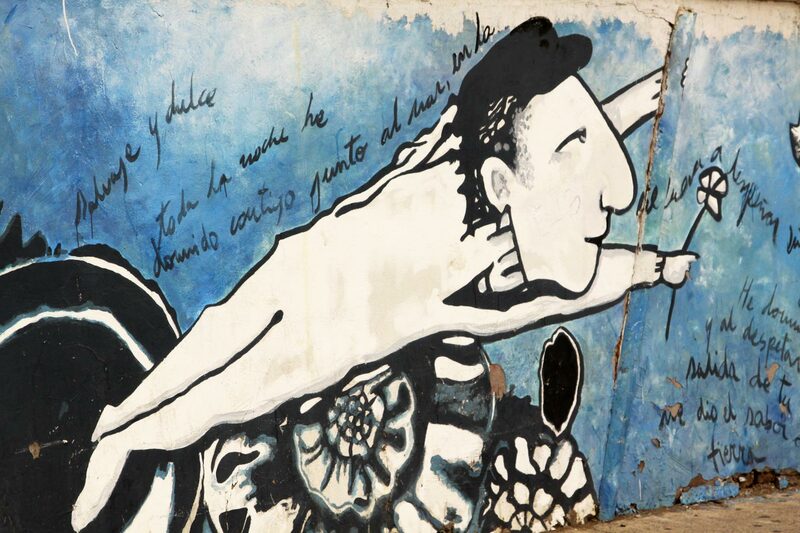 Street art depicting Pablo Neruda with his trademark hat. 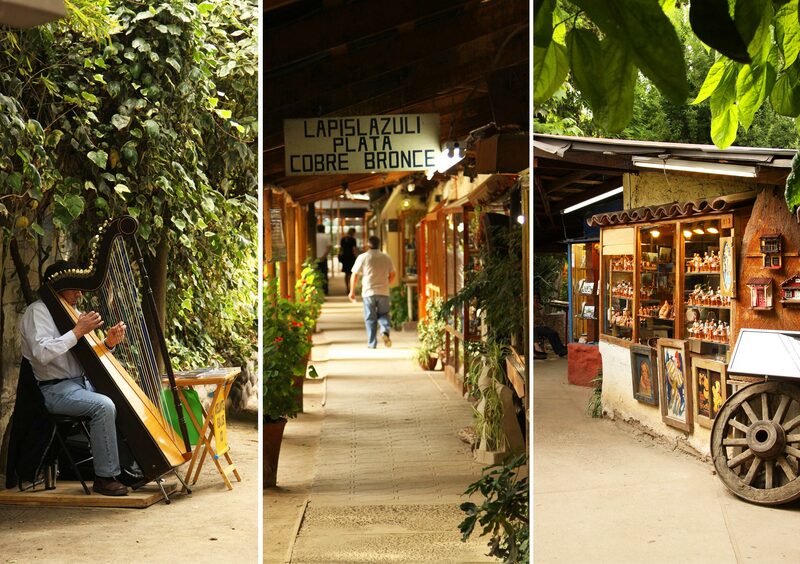 Los Dominicos in Santiago is the perfect shopping hub if you appreciate hand-made craft. At the end of the day, we jumped in a cab, yes, five of us, plus Finn and scooted out to the artisan crafts market known as Los Dominicos. Its a bit of drive but its the epicentre for local artisans who make quality, hand crafted artefacts. The markets originally began as a artists commune supported by the Dominican monastery and now is a bustling craft market where shops sit cheek-to-cheek selling local jewellery, leather, ceramics, pottery, paintings. You could spend hours here there is a network of sandy paths shadowed by willow trees that reveal modest-sized stalls selling everything made under the sun. 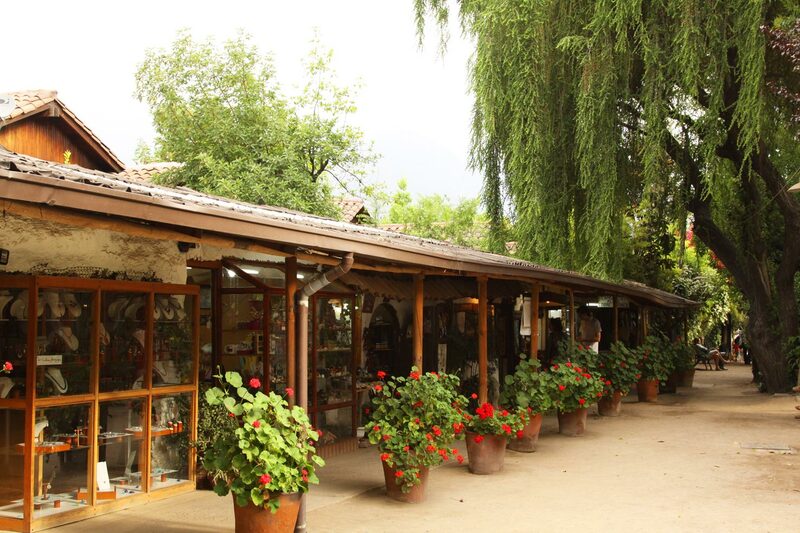 I loved taking my guests here to purchase souvenirs as we’re supporting local artisans and the gifts are unique to Chile.